(Minghui.org) The family of an imprisoned woman who died an unnatural death has been denied state compensation. Ms. Zhao Shuyuan’s son filed an appeal to the Xinjiang Province Prison Management Bureau the day after she died, but it is unclear whether he had received a response before his mother’s body was forcibly cremated by the authorities on August 8. Ms. Zhao, a Falun Gong practitioner, was incarcerated for filing a criminal complaint against former dictator Jiang Zemin for launching the devastating 17-year persecution of Falun Gong. Ms. Zhao, an engineer from Karamay, Xinjiang Autonomous Region, died within 83 days of her prison admission for filing her criminal complaint against Jiang. She accused the former Chinese dictator of initiating the persecution of Falun Gong that resulted in her lengthy imprisonment in the past. The 52-year-old Ms. Zhao was transferred to Xinjiang Women’s Prison in Urumqi on May 3 to serve a five-year term. Her health quickly declined, as the guards kept force-feeding and torturing her. Meanwhile, the prison repeatedly denied Ms. Zhao’s family’s requests to have her released on medical parole. Even after she lost consciousness on three occasions, the prison still refused to render her proper treatment. Ms. Zhao died on July 22. According to China’s state compensation law, inmates are entitled to state compensation if they are injured or die as a result of abuse, mistreatment, or other human rights violation imposed on them by prison workers. Families of deceased inmates may further request compensation for non-economic losses, such as pain and suffering, and emotional distress. Ms. Zhao’s son and his two lawyers filed a state compensation request to the prison on July 26, demanding a total of 2 million yuan in special damages (covering medical expenses, funeral expenses, and loss of earnings) and general damages (covering mental suffering). They accused the prison of dereliction that resulted in Ms. Zhao’s unnatural death. The prison issued a decision one week later to deny state compensation. The very next day, on August 8, they had Ms. Zhao’s body cremated. Ms. Zhao was arrested in her hometown of Karamay, Xinjiang Autonomous Region. Ms. Zhao was tried without her lawyers’ knowledge. Ms. Zhao was sentenced to 5 years in prison. Ms. Zhao was transferred to Xinjiang Women’s Prison in Urumqi. Ms. Zhao was taken to Xinjiang Medical School Fifth Affiliated Hospital for a required checkup. The doctors reported she was in good health. Ms. Zhao’s two lawyers met with her and were shocked to notice she had lost a significant amount of weight. They immediately filed a verbal request for her medical parole, but were turned down. Ms. Zhao’s son and her lawyers submitted a written request for her medical parole, but were again unsuccessful. Ms. Zhao lost consciousness and was rushed to Xinjiang Medical School Fifth Affiliated Hospital. When she came to hours later, the guards immediately took her back to prison, despite the doctors’ warning that her condition could deteriorate quickly without inpatient care. Ms. Zhao passed out again and was sent to Xinjiang Air Force Hospital. The doctors said she was in serious condition, but she was again taken back to prison as soon as she regained consciousness later that day. Ms. Zhao lost consciousness for a third time. She woke up about four hours later, only to slip into a coma shortly afterwards. The doctors at Xinjiang Medical School Fifth Affiliated Hospital issued a critical condition notice at 6:00 p.m., but the prison insisted she be taken back, citing lack of funds to cover her medical expenses. Her family strongly requested that Ms. Zhao stay in the hospital for further treatment at their own expense. The prison officials relented, but it was too late. Ms. Zhao died at 6:05 p.m.
Ms. Zhao’s son hired two lawyers to help his family seek state compensation for his mother’s unnatural death. The lawyers filed a written request for state compensation to Xinjiang Women’s Prison. The prison issued a decision to reject the family’s state compensation request. Ms. Zhao’s son filed an autopsy request on the same day. Ms. Zhao’s son filed an appeal to the Xinjiang Province Prison Management Bureau, hoping the agency would reverse the prison’s decision. The prison hired a medical examiner to perform an autopsy on Ms. Zhao’s body. It is unclear if her family was given the autopsy results. The prison had Ms. Zhao’s body cremated. (Minghui.org) An engineer from Karamay, Xinjiang Autonomous Region died 83 days after she was admitted to Xinjiang Women’s Prison in Urumqi to serve five years for filing a criminal complaint against Jiang Zemin. Ms. Zhao Shuyuan accused the former Chinese dictator of initiating the persecution of Falun Gong that resulted in her 9-year imprisonment earlier. The 52-year-old woman was arrested on November 5, 2015 and sentenced to prison on March 7 of this year. She appealed, only to have her verdict upheld without an open hearing. She was transferred to Xinjiang Women’s Prison on May 3. Her health quickly declined as the guards kept force-feeding and torturing her. Meanwhile, the prison denied her medical parole. Even after she fell into a coma on three occasions, they still refused to render proper treatment. She died on July 22. Her family requested that her body be sent back to Karamay, but the prison authorities forcibly moved it to a morgue in Urumqi and threatened to have it cremated within 10 days. When Ms. Zhao’s two lawyers met with her on May 31, they noticed she was extremely emaciated, weighing around 70 pounds. They immediately filed a request for her medical parole, but it was rejected. Her son and lawyers made a second request on June 23, only to be denied again. They next visited the prison administrative bureau, but their quest for her medical parole went nowhere. Ms. Zhao fell into a coma three times in her final days, but was never given proper treatment. She first lost consciousness on June 26. The guards rushed her to a local hospital, but took her back as soon as she came to hours later. She fell into a coma again on July 12, and the doctors issued a “serious condition” notice. The guards brought her back the very next day. She was in and out of a coma for a third time on July 19. Despite the critical condition notice issued by the doctors, prison officials planned to bring her back on the second day, citing lack of funds to cover her medical expenses. Her family strongly requested she stay in the hospital for further treatment at their own expense. The prison officials relented, but it was too late. She would die three days later. In 1999, Jiang Zemin, as head of the Chinese Communist Party, overrode other Politburo standing committee members and launched the violent suppression of Falun Gong. 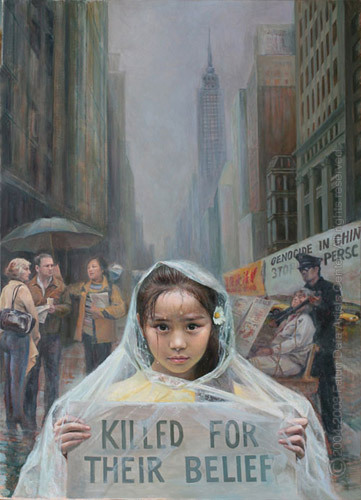 The persecution has led to the deaths of many Falun Gong practitioners over the past 17 years. More have been tortured for their belief and even killed for their organs. Jiang Zemin is directly responsible for the inception and continuation of the brutal persecution. Under his personal direction, the Chinese Communist Party established an extralegal security organ, the “610 Office,” on June 10, 1999. The organization overrides police forces and the judicial system in carrying out Jiang’s directive regarding Falun Gong: to ruin their reputations, cut off their financial resources, and destroy them physically. Chinese law allows for citizens to be plaintiffs in criminal cases, and many practitioners are now exercising that right to file criminal complaints against the former dictator. (Minghui.org) Twin sisters Ms. Wang Wen and Ms. Wang Jing from Changji City in Xinjiang Autonomous Region were arrested on March 6, 2015 for practicing Falun Gong. Ms. Wang Jing was put through an illegal trial on October 13, and Ms. Wang Wen was tried on November 6. The 51-year-old sisters are both accountants. Ms. Wang Wen worked in the Changji Woolen Factory, but she was fired because she practices Falun Gong. She was working for a private company prior to her arrest. Ms. Wang Jing works in the Changji Commerce and Industry Bank. This is not the first time the sisters have been persecuted for their belief in Falun Gong. In 2003 officers from the Changji 610 Office sent them to brainwashing classes, where various torture methods are used to manipulate practitioners into renouncing their faith. Ms. Wang Wen was then sentenced in 2010 to 15 days in detention after she talked to a security guard about Falun Gong. The twins’ elder sister, Ms. Gong Xiaojuan, a former mathematics teacher at Changji Teachers’ University, was sentenced to five years in prison last year for practicing Falun Gong. She had been illegally surveilled in her workplace for a year before her arrest. With all three of her daughters illegally detained, their 71-year-old mother, who is in need of care, has been left home alone. Ms. Wang Wen is currently detained in Liudaowan Detention Center in Urumqi City. Ms. Wang Jing is being held in Changji Detention Center. The Changji City Court tried Ms. Wang Jing on October 13. The prosecutor alleged that she used cellphones to send text messages promoting Falun Gong. Ms. Wang Jing told the judge that practicing Falun Gong is not a crime. Her lawyer disputed the evidence against Ms. Wang Jing, because the prosecution could not provide a key piece of evidence: the SIM card that Ms. Wang Jing allegedly used to send the messages. The right to freedom of speech is protected by the Chinese Constitution. Depriving a citizen of this right is a violation of the law. People who clarify the truth about Falun Gong are not guilty of any crime. Regardless of whether evidence exists or not, Ms. Wang Jing did not commit any crime.